admission free of charge, as far as resources permit. 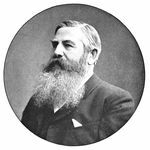 The founder and first head of the Heidelberg Children's Hospital was Baron Theodor von Dusch. 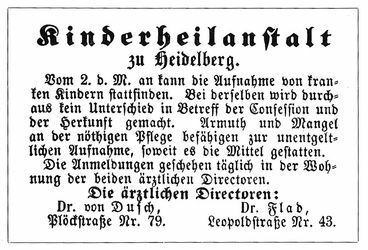 On Sunday 1 July 1860 the opening ceremony of the children's hospital took place in a rented apartment with only six beds. 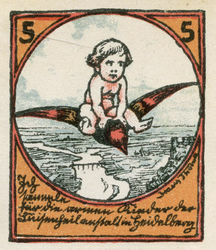 A small ad in all of Heidelberg's daily newspapers indicated that as of Tuesday, 3 July, children may be admitted there. The basic equipment had been donated by sponsors. 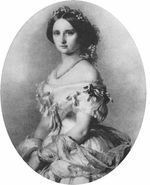 On 29 April 1864 her Royal Highness, the Grand Duchess Luise of Baden, accepted the invitation of the board to become patron of the hospital. In 1867 the first Luisenbazaar took place to support the Luisenhospital. 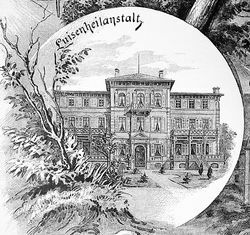 Initially the clinic was located in different houses in the Bergheim district a permanent building newly constructed on the left bank of the Neckar River, opened in 1885. The hospital now had 45 beds. 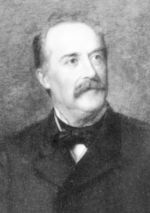 Ernst Moro, the first ordinary professor of pediatrics in Heidelberg, enlarged the Luisenhospital by one floor and among other innovations, installed a terrace on the roof for fresh air therapy of tuberculosis. The renovation was supported by a generous gift in his last will of Kommerzienrat Fritz Landfried in 1913.